The last we heard from Greek metal band Lightfold was 2014's Time To Believe. 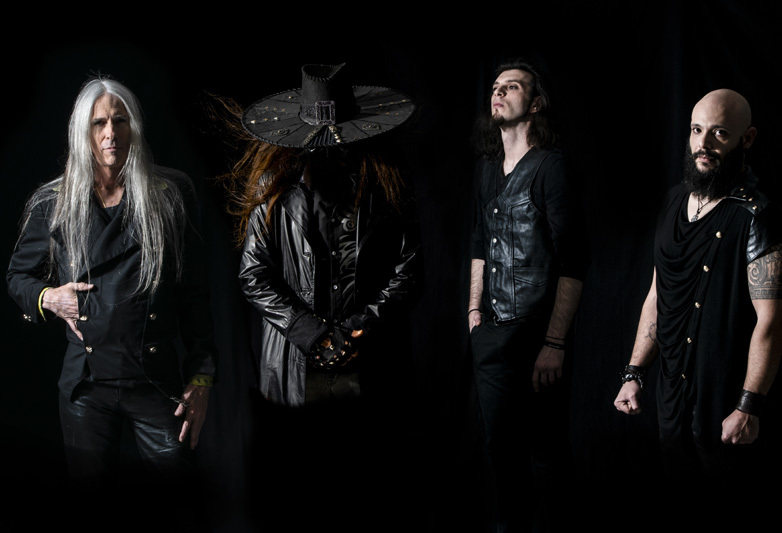 Now the band returns with their second effort Deathwalkers, featuring new vocalist Martin Deathwalker. Yeah. I'm sure that's his real name too. 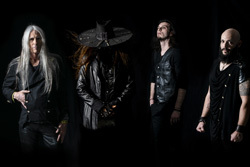 I think he's the fellow under the big scary Halloween hat in the band picture below. The album is a concept album, with Lightfold exploring the mysteries of life and death, mostly death. Like what lies beyond this mortal coil type stuff. While philosophically, or theologically, speaking that exploration is cause for both discussion and intrigue, what's more impressive is Lightfold's music. The larger category is probably progressive metal, but with a great many parts including, melodic, symphonic, and power metal. The song arrangements can be intriguing in their entertaining complexity. You'll often find a mixture of musical elements within each composition like symphonic and swirling synths, interplay between acoustic and electric guitar, eclectic and polyrhythmic drumming over a steady bass line, and a dramatic vocal performance. All the these things can be wrapped up in mixed pacing and twisting time signatures. Although, you will notice that for most every guitar solo, the pace hastens almost automatically. If all these things are not enough, Lightfold drops in choral vocals from three female vocalists. 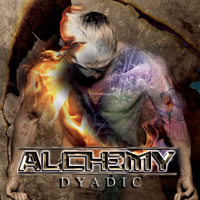 Within the melodic metal anthem, Angel Of The Earth, you'll hear Deathwalker in a vocal duet with one of the vocalists. Curiously, I found myself intrigued by two things in Lightfold's song composition. The first was simply the powerful and soaring guitar solos from Thanasis Labrakis. But that goes with out saying, as most faithful readers know, I love lead guitar work. But the second element was how the band would start a song. For example, Save Me, Behind The Veil, and Deathwalkers (Julia) have these playful and engaging light starts that fuse guitar and synths over a tight bass line and crisp drumming. Beyond The Unknown invites musical drama with its epic riff and drum beginning. With The Collector, it's first riffs and swirling synths before the drums kick in for a large bombastic start. Those drums remain a guiding force within the song. The aforementioned Angel Of The Earth opens with a soaring Labrakis guitar solo suggesting a metal ballad, but quickly turns into some hasty power metal. It also another song where the female choral vocals appear. 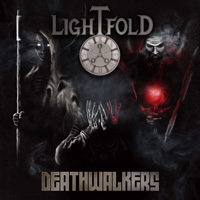 Simply said, Lightfold's Deathwalkers is both impressive and entertaining melodic progressive power metal. I think they've raised their own bar with this album. Recommended. Simply said, Lightfold's Deathwalkers is both impressive and entertaining melodic progressive power metal. I think they've raised their own bar with this album. Recommended.